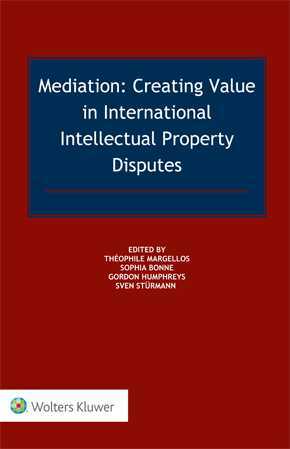 Mediation: Creating Value in International Intellectual Property Disputes offers readers key information, incentives and tips to make an informed decision on the use of mediation in the IP area. Mediation is a risk management tool that can significantly mitigate inherent litigation risks, leaving companies free to concentrate on the core business of developing markets for their products and services. If and when disputes arise, mediation provides the means to handle them confidentially and thus keeps them out of the public domain. This book is the first work of its type devoted to the practical A to Z of IP mediation. Disputes about IP rights are frequently multinational, with allegations of infringement and arguments about validity and ownership spanning numerous jurisdictions. As an alternative to expensive, risk-prone and time-consuming litigation, out-of-court settlements conducted through mediation are becoming more common, with the added advantage that they are not tied to the geographical scope of the IP rights at stake. The authors provide analysis and recommendations about drafting settlement agreements, including standard clauses and enforcement, as well as an overview of the main mediation services used to settle IP disputes. This book also includes a discussion on the roles of the mediator, the parties and the lawyers, and how they can properly prepare themselves to maximize the benefits of mediation. This book shows how mediation offers a dispute resolution process at a human level, where parties can not only discuss and resolve their differences but also create added value to the existing IP rights and the business surrounding them. Its practical approach will be warmly welcomed by lawyers, both in-house and outside counsels, IP professionals in general and rights holders and licensees, introducing them to the new possibilities that mediation offers and how they can best avail themselves of those opportunities.